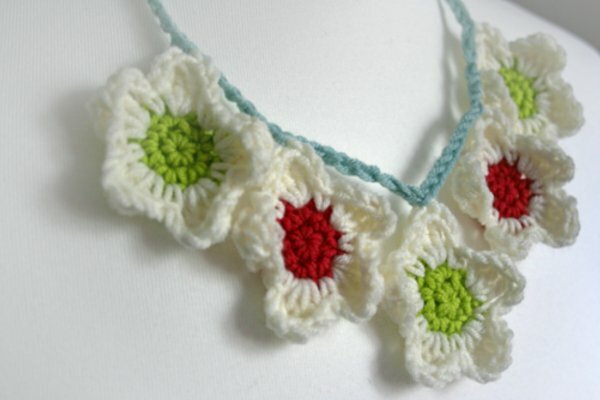 It’s so quick and easy and uses very small amounts of yarn. Yarn: DK / Light Worsted yarn in four colours: Green, Pink, White and Blue. I’ve used DMC Woolly. Sewing needle to sew in the ends. 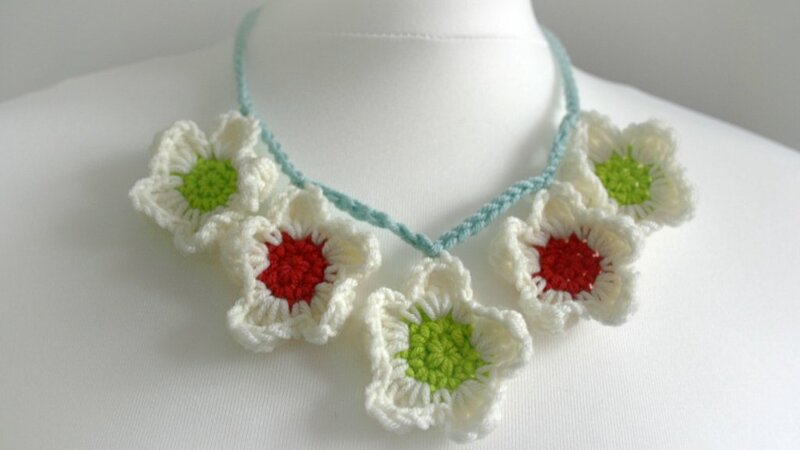 The pattern is in both US and UK crochet terminology so click here to skip to the pattern in US and click here for UK terms. Treble Cluster: Made of 3 treble together. * [yo] twice, insert hook into place indicated, yo and draw through a loop, [yo and draw through 2 loops] twice. Rep from * twice more. yo and draw through all 4 loops on hook. Make three with green centers and two with pink centers. With green or pink, make a Magic Ring (photo tutorial for Magic Ring). With Blue, ch 70, slst into top of any cluster of a green centered flower, ch 6, slst into top of any cluster of a pink centered flower, ch 8, slst into top of any cluster of a green centered flower, ch 8, slst into top of any cluster of a pink centered flower, ch 6, slst into top of any cluster of a green centered flower, ch 70. End yarn. 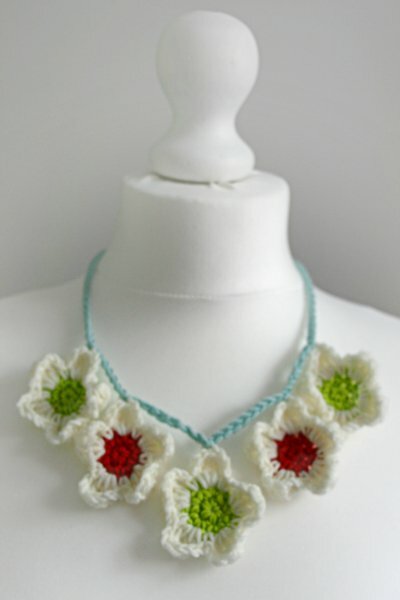 Sew in any loose ends and tie your blossom crochet necklace around your neck! Double Treble Cluster: Made of 3 double treble together. Make three with green centres and two with pink centres. With Blue, 70ch, slst into top of cluster of a green centred flower, 6ch, slst into top of cluster of a pink centred flower, 8ch, slst into top of cluster of a green centred flower, 8ch, slst into top of cluster of a pink centred flower, 6ch, slst into top of cluster of a green centred flower, ch 70. End yarn.